And so I put “don’t like History” in quotes because part of me suspects that people really do like History–they just have been wrongly taught what it is. They have been taught to think that History is memorizing a bunch of names and dates about people and events that are irrelevant to their lives. But that’s not what History is. For one thing, History is not the study of “names and dates”: it’s the study of people. History is the story of how people have lived on this earth, and how they have handled the circumstances life threw at them, like power or disaster or wealth or pain or opportunity. And it’s not irrelevant to our lives. In a very real way, History explains what you see when you look out the window. It explains why you do the things you do, drive on the roads you drive on, eat the foods you eat, think the thoughts you think. It explains in large part why you see the world the way you do and why that way is different from your fellow man across the street or the country or the globe. In other words, History examines the complex forces which have come together to form this present moment. To me, that is fascinating. Learning about people is fascinating. And learning about myself is fascinating. So with all that fascination, what’s not to like? Like a lot of people, I struggle with worry and anxiety. Over the years, I’ve realized that worry and anxiety consume me when I am too focused on my immediate circumstances. I think there is such a think as mentally drowning in your surroundings: YOUR health, YOUR family, YOUR finances, YOUR plans. When those things begin to take up too much of my focus, my anxiety over them skyrockets. Conversely, I’ve found that “getting outside myself” and serving others gives me back that freeing perspective that comes with knowing the world is bigger than my problems. Allowing others’ lives and perspectives into my thoughts helps put my own in perspective. The same thing happens when I read History. 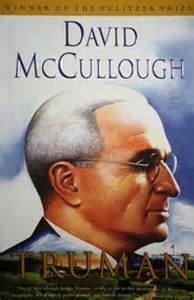 I read David McCullough’s excellent biography, Truman, for example, in a time of great financial stress for Greg and me. We were trying to sell our house in South Carolina and having to still make payments on it while also carrying a mortgage on our house in Tennessee. It was bad. It caused me lots of anxiety. And nothing helped relieve that anxiety than by reading about all Harry Truman went through as President. I drew actual comfort while reading about this average American who grew up on a farm was thrust into the highest office in the land without so much of a briefing of how World War 2 was going…how he was expected to negotiate the end of the war in Europe…to make a decision about dropping a terrible weapon to end the war in the Pacific…and forced to take the lead in rebuilding the world. At one point, he and his advisers thought they were literally faced with the beginning of World War 3 and were frantically trying to avoid it, and Truman’s stoicism and courage in that time was such a inspiration to me. And I can honestly say that “watching” that man navigate and handle such immense stress in his own life really put my own stress in perspective. It helped me to relax about my financial situation, and realize that it truly wasn’t the end of the world. At least, not in the same way that World War 3 would be the end of the world! Sometimes when you look at the scope of the whole world and all that is going on, it seems very scary. History doesn’t necessarily negate that awareness, but when I read History, I’m reminded that the world has always been scary…and that lots of times have been way scarier than these times. Reading History also reminds me that the scary times pass, and that’s comforting to me. On September 11, 2001, a day that was full of fear and turmoil, one of the most genuinely comforting thoughts I had was picturing the wording that my high school History textbook, The American Pageant, would use to describe the event in twenty years. Maybe that seems like a weird source of comfort, but there is something inherently calming in knowing that what seems so huge and tumultuous and fearful will one day be just another source of boredom to a disinterested high school student. History gives me perspective on my life situation. This is a huge spiritual benefit of reading History. I think humans naturally tend to assume that our experience is normal, whereas History reminds us of all the ways our circumstances are unique. For example, in our area of the country and time and History, we might assume a certain house size is “normal,” a certain amount of clothes are “normal,” or the ways we spend our money are “normal.” History tells us that it isn’t. In fact, History tells us that today’ “normal” lifestyle in America is actually quite excessive, and knowing that helps me to better evaluate my use of resources. That’s just one example of how History has redefined my life expectations. I could also talk about my expectations of “normal” when it comes to experiencing pain or educating my children or eating food or a number of other issues. But suffice it to say that History has both made me more grateful and more thoughtful about how I live my life. History provides me with useful examples of how to live this life. This is more than a nerdy/fun mental exercise. Because of my Christian beliefs, I am inspired to use my little life to the absolute best of my abilities, and the more advisers and examples I can have, the better. And I’m not talking about some one-dimensional perspective like, “I should always do what Harry Truman did.” No, that’s not it at all. It’s more like, by observing these influential people and the way they spent their little lives, I can glean lessons and inspiration for my own–both through their triumphs and their faults. I guess you could say that History deepens my understanding and experience of humanity by giving me a rich source of varied experiences from which to draw. Those are just some of the ways that reading History shapes me on a spiritual level. To demonstrate this, I’d like to occasionally review History books I’ve read and specifically point out their spiritual lessons. And I have a great book to start with…stay tuned! Do you like History? Why or why not?